Our 'Ways to Nature' project started in 2018 and will continue throughout 2019 and into 2020. We have been awarded funding for this project from a number of different sources. Scroll down or use the links above to find out more about the different aspects of the project. We are delighted to have received support for a large part of this project from the National Lottery Heritage Fund (formerly the Heritage Lottery Fund) 'Our Heritage' programme. Thanks to money raised by National Lottery players, we will now be able to achieve the majority of our aims to protect the wildlife on Troopers Hill Local Nature Reserve; carry out some further wildlife surveys and run some educational events such as guided walks. 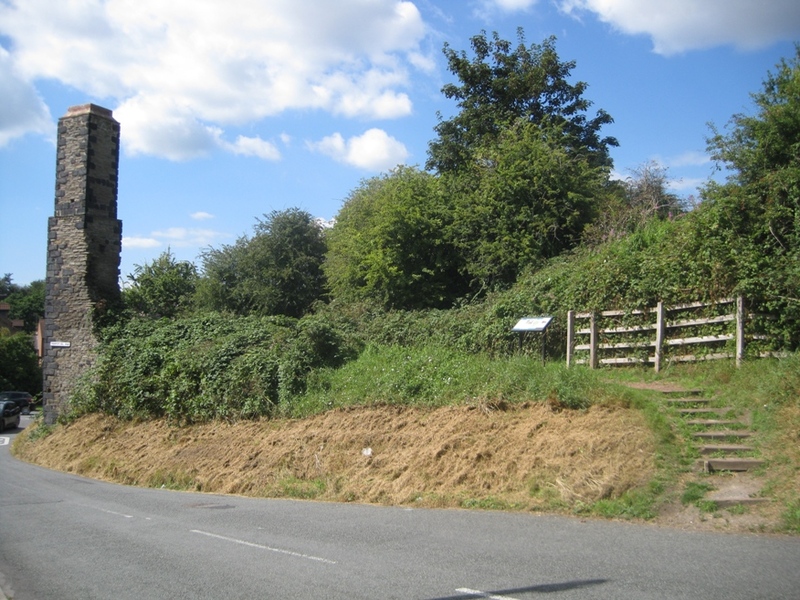 The funding from the Heritage Lottery Fund of over £44,000 will fund most of the work described below on the Local Nature Reserve, including the entirity of the Protecting Nature and Surveying Nature parts of the project. 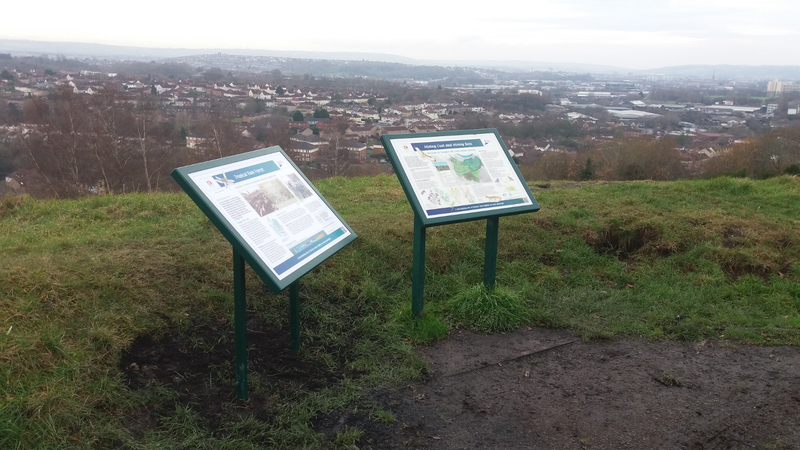 We were able to announce at our meeting on 6th December 2018 that we have received funds through the Landfill Communities Fund (LCF) from both Enovert Community Trust (ECT) and Ibstock Enovert Trust (IET) for the path and track on Troopers Hill Field. Our local Councillors also supported this part of the project by allocating Community Infrastructure Levy funds through the Area Committee. Our successful application to the Committee was was championed by Cllr Fabian Breckels. 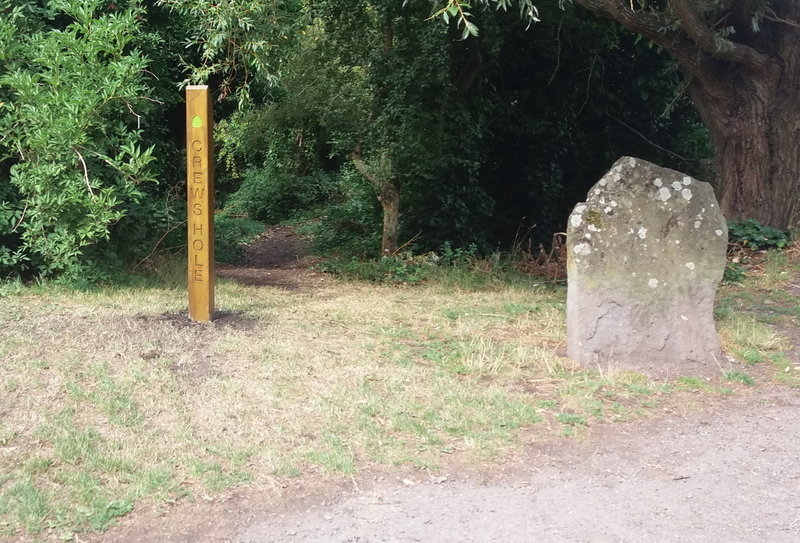 We have received funding for the works in the woodland from the Avon Frome Partnership, this was completed in August 2018. The Nineveh Charitable Trust funded Natural Learners to run inspiring educational experiences on Troopers Hill for families and school children in summer & autumn 2018. A big thank you to everyone who has supported our funding bids including everyone who responded to the consultation in 2017 and those who wrote letters of support for our funding bids - Professor Jane Memmott of the University of Bristol; Janice Gardiner of Avon Wildlife Trust; Chris Watson, course leader in Geography at Bridgwater and Taunton College; Kerry McCarthy, MP for Bristol East; Fiona Lambert of Bristol Astronomical Society; Lee Morgan at East Bristol Intermediate Care Centre; Tim Browse, Headteacher Air Balloon Hill Primary School and our local councillors, Cllr Nicola Beech, Cllr Fabian Breckels, Cllr Asher Craig and Cllr Steve Pearce. Thank you also to everyone at Bristol Parks. Wooden boundary fencing was installed on Troopers Hill Rd in 1991. By 2016, the fence, was rotting and close to collapse (photos below). As part of this project the rotten fencing and gates are being replaced with black, metal estate fencing and gates - this work started in April 2019. New fencing is only being installed on those sections where scrub does not act as a natural barrier. The fencing is galvanised steel and is painted black on site after installation. 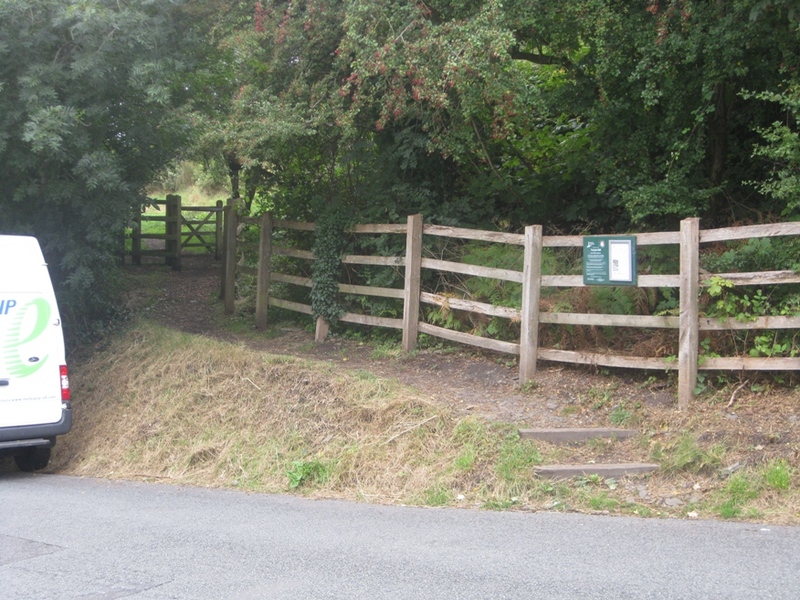 Similar fencing, a contractor’s gate and a kissing gate were successfully installed on the Greendown boundary of Troopers Hill in 2008 using funds raised by the Friends of Troopers Hill. This is a long term solution that blends in well with landscape. Collapse of the fence would have left the Local Nature Reserve would have been open to access by motorbikes. This would have represented a danger to the people and dogs using the Hill and have a severe, negative impact on the site’s ecology. A Management Plan for Troopers Hill was produced in 2007 and reviewed in 2012 without any major changes. A review of the plan of the plan was due in 2017 but funding was not available so we are pleased that the funding for this project from the National Lottery Heritage Fund has allowed the review to be carried out. The review considered the effectiveness of the management of the site over the past 10 years and the aims for the future. As part of this review we are commissioning surveys to establish what species are present on the Hill and whether there have been any detectable changes over the last 10 years. This includes an Invertebrate Survey by David Gibbs, who last carried out a survey on the site in 2007. The revised plan is now being written and a draft can be seen on our Management Plan page. A final review of the plan will be completed once we have received the results of the surveys. In advance of the plan being published we received advice on the priorities for work to be carried out in the winter of 2018/19. The grant from the Heritage Lottery Fund includes an allowance for us to employ contractors to carry our some of this work over two winters. 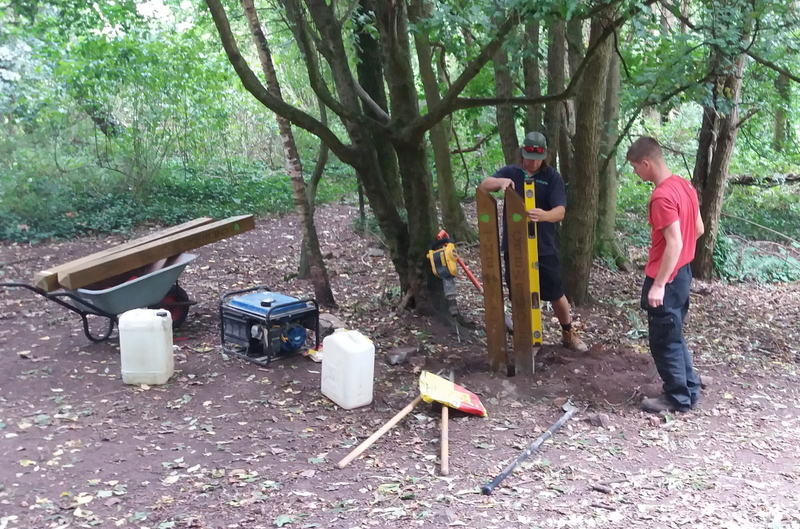 This is additional to the regular works carried out every winter by Bristol Parks and by Friends of Troopers Hill at our Conservation Work Parties. 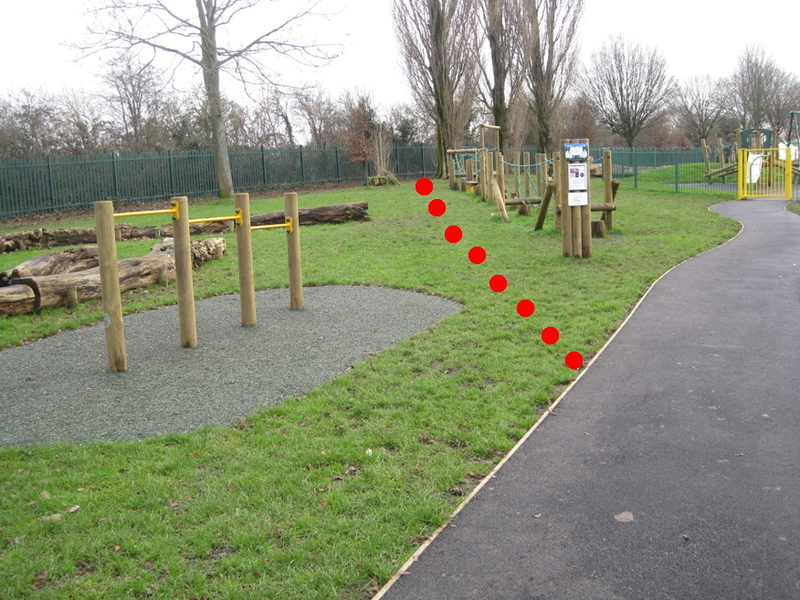 The work is being carried out by Green Mantle who are approved Bristol Parks contractors. We organised a Conservation Walk on Sun 16th Dec 2018 to talk about the plan and additional habitat management works that we have commissioned to be carried out during the winter of 2018/19 based on the new plan's recommendations. Further walks will be arranged in the future. While much has been done over the last 10 years to provide additional site interpretation and to host guided walks and events to highlight the importance of the site, there is always the need to do more. • A series of walks throughout 2019 to inform local people about the site - see our Events page for details. • A new interpretation board to be installed focusing on fungi. • Some trial sessions of outdoor learning for adults with learning difficulties. • Installation of a new welcoming sign to the site on Troopers Hill Road, including acknowledgement of our main funders. • Work with Natural Learners to run inspiring educational experiences on Troopers Hill for families and school children in 2018. While Troopers Hill Local Nature Reserve and Troopers Hill Field are beautiful spaces their accessibility for those with mobility problems is limited. 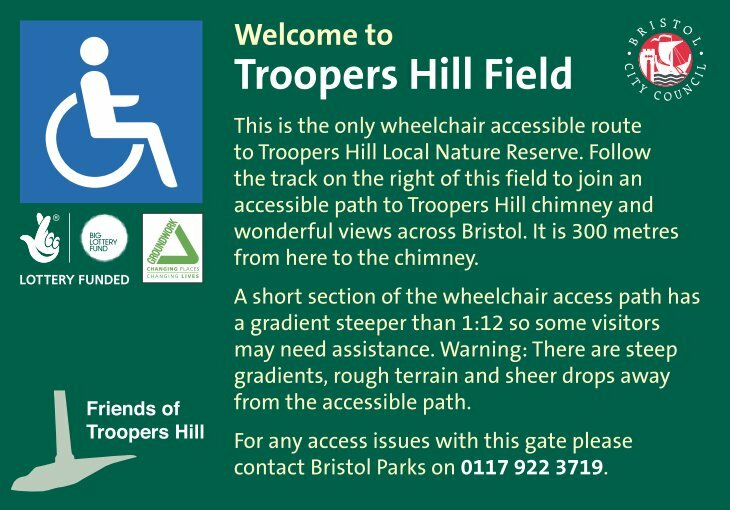 The entrance to Troopers Hill Field from Malvern Rd displays a sign for wheelchair users advising them of the level of difficulty it would take to cross the Field to access the beautiful views from Troopers Hill. The wide track, leading from Malvern Rd, into the Field, is just compacted stone dating back to at least the 1970s. It is now deteriorating. We have been contacted by one visitor who told us the track is now too difficult for him push his wife along in her wheelchair. At the end of the track park maintenance vehicles (including those regularly emptying the bins) need to turn, this makes this area particularly muddy. The east side of Troopers Hill Field, beside the allotment fence is a favourite route for walkers to access Troopers Hill but it becomes very waterlogged and muddy in winter. The wheelchair access path on Troopers Hill is also deteriorating. The resin surface is breaking up. Bristol City Council has done some filling of potholes but this is only a temporary solution. For walkers there is an alternative approach to the Hill from Crews Hole via paths and steps through Troopers Hill Woods, but these were difficult to follow until waymarking was installed as part of this project (see below). 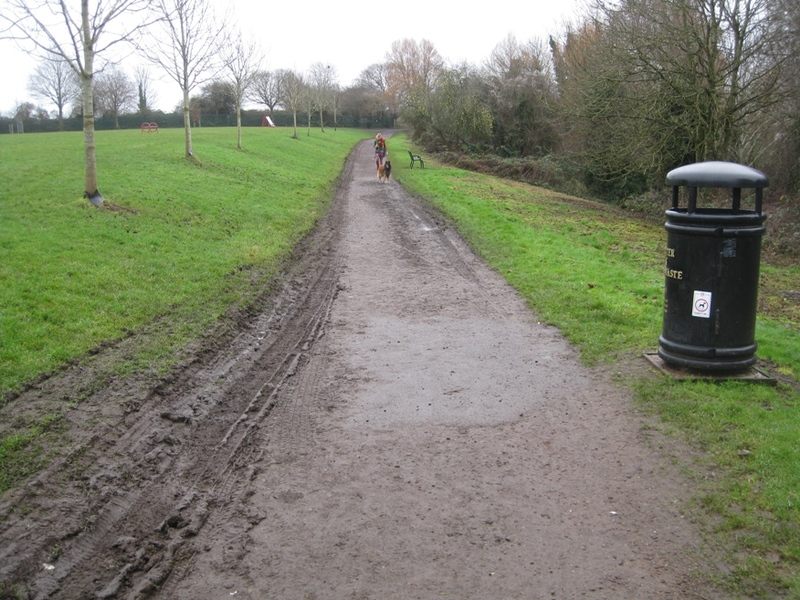 a)	Resurface and widen the track across the Field so it is suitable for wheelchair use and for the size of vehicles used by Bristol Parks for grass cutting and emptying bins. b) Form a proper turning area at the end of the track, so that vehicles can turn safely and will no longer create a muddy area at the entrance to the hill. 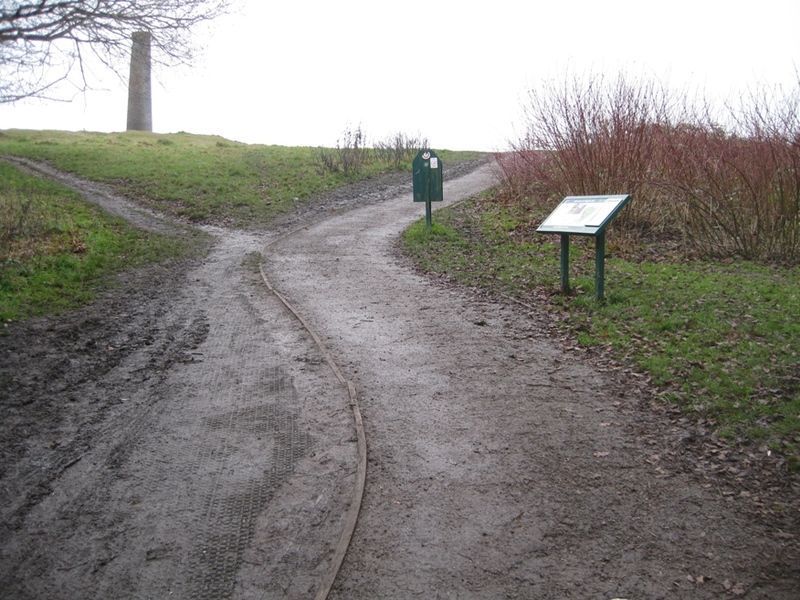 c)	Install a new tarmac path on the east side of Troopers Hill Field connecting the new path to the children’s play area to the wheelchair accessible path to Troopers Hill. e) Improve & install waymarking to paths through Troopers Hill Woods. 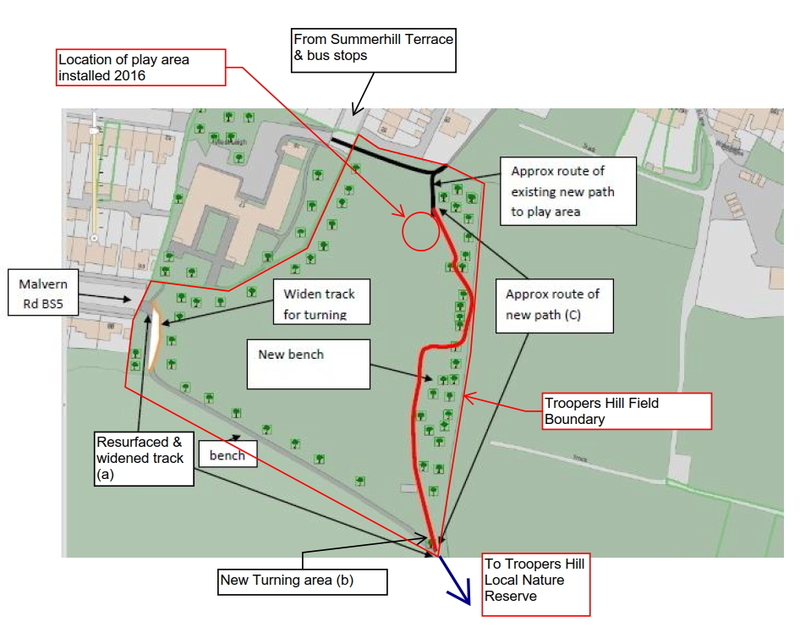 Details of the proposed works on Troopers Hill Field are shown in red on the plan above (click to enlarge) and the photos below. 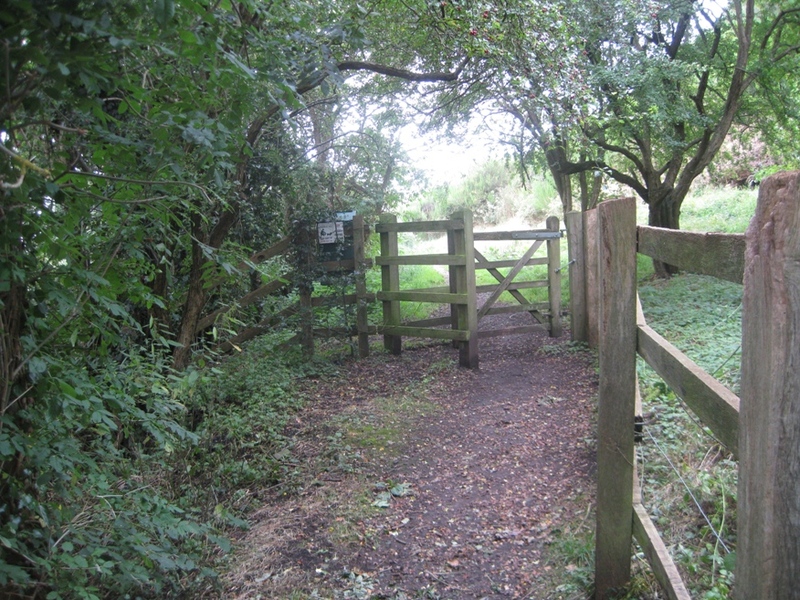 We were pleased to receive funding for the works in the woodland from the Avon Frome Partnership. This was completed in August 2018, see photos below. An application for funding for the new path and to resurface the track has been submitted; we expect to hear whether we have been successful in early October 2018. We are pleased that our local Councillors have supported this part of the project by allocating £25,000 of Community Infrastructure Levy funds through the Area Committee. We have been able to use this as match-funding in our bid. Our successful application to the Committee was was championed by Cllr Fabian Breckels. Proposed connection to existing path. 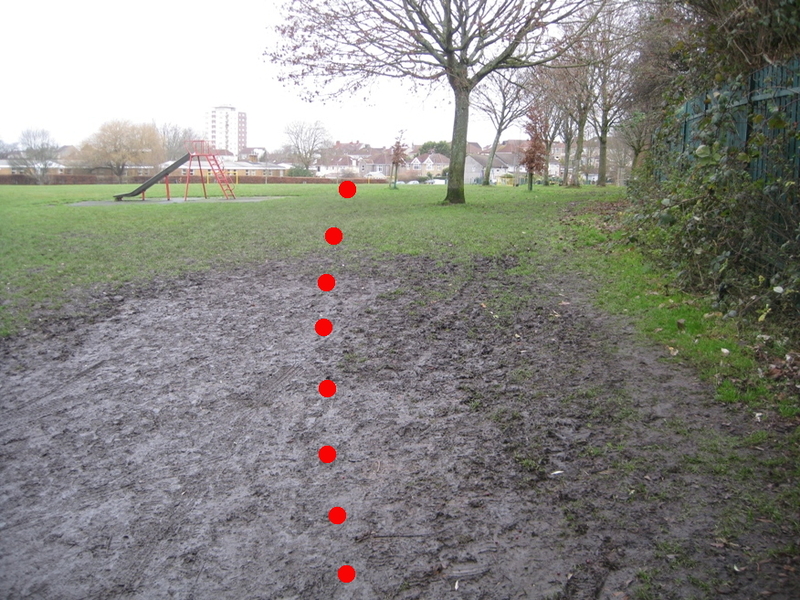 Path route across existing muddy area. Existing entrance to LNR in winter. Friends of Troopers Hill knew that in order for this project to be successful we needed the support of local people. We also needed to be able to demonstrate that support to potential funders, so during 2017 we asked for the views of as many local residents as possible. We produced a survey that could be completed online via this webpage and also distributed hard copies of the survey to local residents and users of the Hill & the Field. The survey was open for just over a month, with a closing date of 12th July 2017. The results - were on display at our Bugs & Beasties event on the Hill on 12th August 2017 and can be seen via the link below. A total of 225 responses were received. The 71 paper questionnaires were copy-typed by volunteers into the online system so the results could be seen as a single report. Just over 67% of replies said people would visit more often if the work was carried out to improve paths, the track and install a new path. 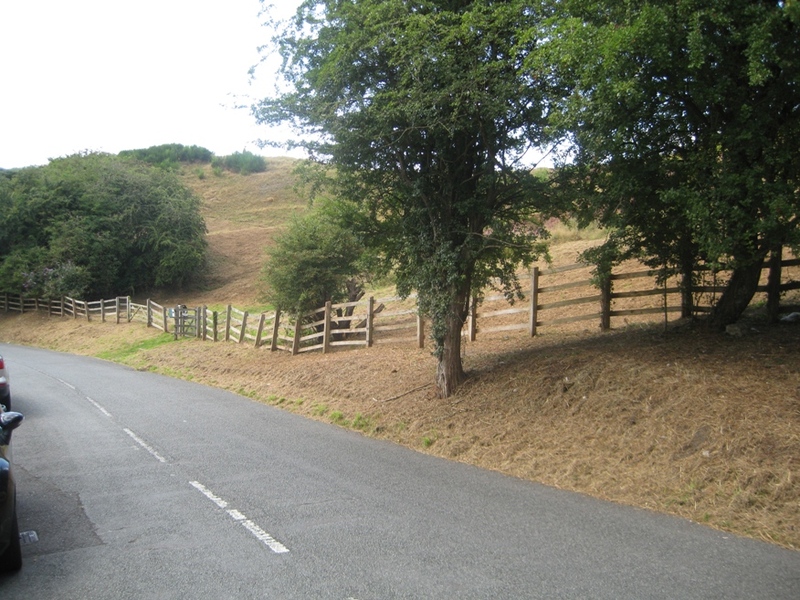 Nearly 89% of replies were in favour of replacing the rotting wooden boundary fences and gates on Troopers Hill Rd with metal estate fencing as protection against access by motorbikes. 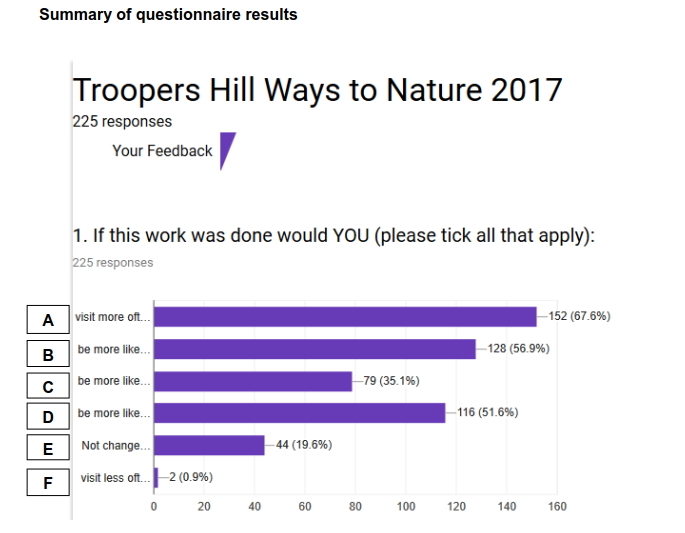 The results of this survey gave Friends of Troopers Hill a clear mandate to go ahead with grant applications to fund the Ways to Nature project and we are now progressing the application process. We are applying for a number of separate grants for different parts of the project.